Ask for a rebate from 1'700 pcs. A convenient solution if you would like to glue on a disc magnet. 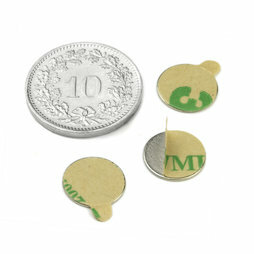 This is a very flat disc magnet (10 mm diameter, 0.6 mm thin) with a self-adhesive side. Simply remove the foil, stick it on and your smart mailing or creative arts project is done. With a S-10-0.6-STIC you can also hang up pictures without drilling holes. 10 pcs. 0.72 CHF ea. 20 pcs. 0.36 CHF ea. 40 pcs. 0.20 CHF ea. 20 pcs. 0.24 CHF ea. ... and your name tag is ready. You can find tips and tricks for creating name tags here. The video shows how a card can be closed with two self-adhesive magnets.